DENNIS BALTHASER SEEMS to appear right out of the wild blue yonder. When I pulled up to our prearranged meeting place, I didn’t notice anyone else in the parking lot. But as I step out of my car and turn around, he’s suddenly there, an apparition in a denim vest and leather jacket. A dedicated UFO investigator, he’s staring at me through black aviators, leaning against his SUV like James Dean against a fencepost. Two clean toothpicks are tucked under the band of his chocolate-brown cowboy hat. “Ready to go?” he asks. 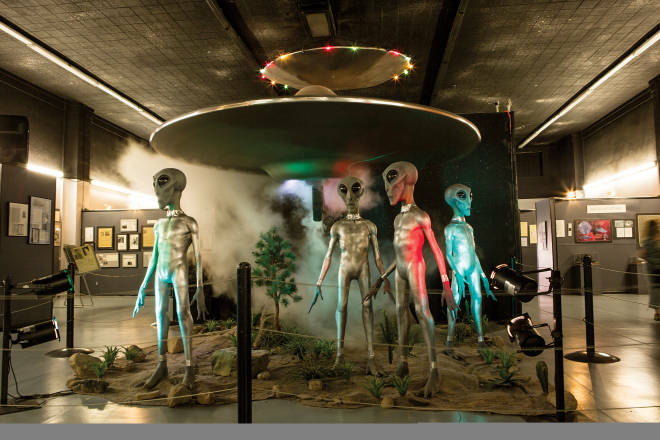 Balthaser is the proprietor and sole employee of Roswell UFO Tours, which provides two-hour drives around town, highlighting 20 spots related to the infamous 1947 Roswell incident, which marks its 70th anniversary this July. As the tale is told, a flying saucer, possibly attracted by humanity’s fledgling attempts to harness the power of the atom, traveled across the endless expanse of the universe only to end up shipwrecked on a southeastern New Mexico ranch. Balthaser knows the details of the suspected UFO crash and cover-up, many of which he has gathered himself over decades of investigation and interviews. A former infrastructure engineer, he moved to Roswell to do some consulting work and to semi-retire. But the town took hold of him, and the wonder he felt staring up at the stars as a boy resurfaced. So he ended up here in this parking lot with me. We climb into his vehicle. We’re off like a rocket. We whip from north to south across the town, from the newly built-up row of hotels and restaurants through downtown and on to the airport, once a military air base. It’s where much of the drama of the UFO crash is presumed to have happened. In 1941, the government established the Roswell Army Air Field, a sprawling city within a city. Some of the original houses and facilities are still there, and Balthaser points out the homes of the important players, like base commander William Blanchard, along with a runway big enough to land the space shuttle or, as happened in 2016, Air Force One. Balthaser is explaining all this, as well as sundry bits of local trivia—“did you know that Roswell’s had its own symphony orchestra for almost 50 years?”—when he turns to me. “So, you learning anything?” he asks. I assure him I am as I scramble to get everything he’s saying written in my notebook. As he wheels around the former base, he tells me he’s pleased that some of the old buildings are still standing. “I don’t want to sit at a desk with some pictures,” he says. SEATED IN THE CENTER of a wide empire of ranchland, Roswell is nearly 200 miles in every direction from the next major city. As such, it’s been a historic hub for people from all across the region’s gently undulating green-gold grasslands. If it weren’t for World War II and the peculiar events of the summer of 1947, the town may well still be known as the Dairy Capital of the Southwest, in the same way that, had a Scotsman not claimed in 1933 to see an aquatic monster in its waters, Loch Ness might still be known as a bonny place to go fishing. Roswell’s peculiarities took root in late 1945, when the 509th Composite Group, responsible for the atomic bombings of Hiroshima and Nagasaki, moved in to run nuclear operations during the impending Cold War. Two years later, then-Sheriff George Wilcox heard from ranch hand William “Mac” Brazel about some flying saucer debris he’d found. He phoned the base to send officers to retrieve it. On July 8, base information officer Walter Haut sent out a press release claiming that a “flying disc” had been found. The national wire services picked up the front-page news, but the next day the Army revealed it was nothing more than a weather balloon. And just like that, the story vanished for more than 30 years. In 1980, the first conspiracy book, The Roswell Incident, flew off the shelves. The godfather of Roswell researchers, Stanton Friedman, dubbed the event the “cosmic Watergate.” As the stories of cover-ups grew, believers, skeptics, and the merely curious began finding their way to Roswell. By the 1990s, the town’s other-worldly visitors were good for business. The name Roswell infiltrated popular culture, earning a visit from Mulder and Scully on The X-Files and a mention in the 1996 blockbuster Independence Day. In 1995, Fox’s Alien Autopsy: Fact or Fiction report on a hoax alleging to be footage of aliens from the 1947 crash was the highest-rated show the night it aired. New Mexico politicians like former governor Bill Richardson and the late congressman Steven Schiff weren’t convinced the government was being forthright about UFOs and argued for declassifying more material on sightings. In 1991, a group that included erstwhile press officer Haut founded the International UFO Museum and Research Center. With the museum eventually anchoring Main Street from a 1930s movie theater, the little green men started popping up everywhere, a way to capitalize on the town’s claim to fame. Innocent-looking invaders appeared on kitschy sunglasses, shot glasses, and extra-terrestrial-themed Christmas stockings. Today, downtown Roswell is lousy with aliens. As Balthaser navigates down Main Street, we are practically in an invasion. They wave from storefronts and stand sentry outside the KFC. They dress as matadors and fight bulls on Mexican restaurant walls. The streetlamps all sport two tilted, almond-shaped black dots, creating the illusion of a row of alien heads floating above the sidewalk. The Walmart is painted with a whirling UFO and the smiling face of an extraterrestrial; it’s the only themed Walmart on this planet. The McDonald’s is built to resemble a flying saucer. Museum director Jim Hill, who you might imagine is pleased by all this, has one small problem with the ETs he sees around town. “They’re green,” he says. While aliens in the popular imagination—and all around Roswell, including on the city seal—are a bright green, almost all eyewitness accounts describe them as being gray. Hill isn’t exactly an alien expert, however. He grew up here, and his saber from the New Mexico Military Institute (see “Attention!”), also in Roswell, hangs on the wall above his desk. “As a child growing up, we never really heard about this,” he says. But during a 35-year financial career, New York bond traders, searching for filler conversation, would bring up the incident. When he retired here, he was offered the job to run the museum. They needed someone who knew about business. His response: “Oh, good Lord, no!” The more he thought about it, though, the more it seemed like a good way to promote the town. Last year, more than 200,000 people walked past an iron cutout of Brazel and into the museum. Aliens are here to stay, and so are the people they attract. In the museum parking lot, I take note of license plates from California, Vermont, and Canada. That story draws people in. Connie, working the register at the Alien Stop downtown, tells me that she sees the same Uruguayan woman visit every year during the annual UFO Festival. She’s been coming so long that Connie keeps up with the woman’s kids. I ask my waiter at dinner, Guy Malone, if he has any interest in the incident. He scribbles down his website’s URL (roswellmission.org) and hands it to me. He moved here to investigate the religious implications of UFO mania. Around the world, UFO sightings are on the rise, and places like San Clemente, in Chile, and Hessdalen, in Norway, are diving into their own brands of extra-terrestrial tourism. A surprising new reference guide breaks down recent U.S. sightings—121,036 from 2001–2015—month by month, county by county, shape by shape. From June 29 to July 2, when Roswell’s festival returns, the town will teem with true believers, some skeptics, and the playfully indifferent who relish the carnival atmosphere of the yearly fête. All year round, five days a week, four passengers at a time, Balthaser delivers his expert narration to people from Japan, Germany, and Bangladesh—and the occasional irate retired Air Force officer. He rarely has a weekday off. Most of the time, he’s booked solid. As he drives, he sounds like an old cowboy perched by a campfire who just so happened to memorize the Encyclopaedia Britannica, or at least the entries on UFOs. At some stops, he pulls a neatly organized binder off the dashboard to show me what various parts of town used to look like. Balthaser is doing his best to document as much as he can. If he finds someone new who might have information on the incident, he calls them immediately. “Time is working against us,” he says. As we idle in a hotel parking lot, peering at the nearby office of the Roswell Daily Record—a major player in the early stages of the incident—a car behind us honks. My God, I think, has someone been following us? Balthaser waves a hand out the window, and a minivan passes us. We’re blocking the exit. He’s eager to show off sites “that you can’t see from Main Street.” Some, like the former airfield and its Hangar 84—which may or may not have housed alien bodies and is now being used to refit the fuselage of an American Airlines 747—are still there, and relate directly to the incident. Others, like the Iron Cross mosaic on a Spring River culvert built by German POWs, are simply fascinating bits of local lore, all adding up to an overall sense that you never quite know everything about this place. (The site itself, alas, is off-limits, tucked onto private property, no trespassing.) At each stop, binder of photos in hand, I’m certain I see a glint in Balthaser’s eyes as he reveals hints of the town’s past. I’m fairly certain there’s a glint, at least—he keeps his aviators on at all times. Kintigh doesn’t dwell much on the incident, however. It turns out that it has little to do with the day-to-day running of a city of just under 50,000 people. Instead, he wheels his chair over to a whiteboard and starts drawing a diagram of the aquifer that sits below town, tells me about hospitals and hotels. Maybe, I think for a split second, he’s hiding something. He’s not. Friendly and earnest, he waxes poetic about community events like the Eastern New Mexico State Fair and the UFO Festival’s decidedly kooky costume contest, which he attends dressed in a black suit and dark shades. Get it? A G-man. A man in black. He calls Roswell “the Kitty Hawk of Rocketry,” as it was home to Robert Goddard’s early breakthroughs in building rockets, sits close to the Trinity Site nuclear testing ground, and has a sizable aerospace industry—and a history of harboring aliens on lampposts and storefronts. For Kintigh, the mystery of Roswell is a good thing. A town like this can’t count on other towns to share utilities or hospitals, because there aren’t any other towns around. If thousands of people pause to spend some money and time in his city, they help keep it going. I’m about to leave City Hall when I ask one last question: Does it really matter what happened here in 1947? The mayor smiles and asks me if I’ve ever seen The Man Who Shot Liberty Valance. It’s one of my favorite movies, I say. Kintigh invokes the end of the film (spoiler alert), when Jimmy Stewart’s character, now a beloved local legend, reveals he’s not actually the titular gunman. THE COSMIC COWBOY slides behind the wheel and pulls away from Hangar 84, then heads back downtown. Balthaser isn’t as interested in legends. He wants to know the truth, and he’s dedicated his retirement (“If you can call this retired”) to the truth about that summer 70 years ago. He’s not in it to prove a hypothesis; he just thinks people deserve to know. The truth is out there, I’m told, so I ask Balthaser what will happen if he ever closes the case: What if it was just a mundane accident involving a wayward, misunderstood balloon? We bid farewell and, as I head out of town with the sun sinking behind me and the promise of a starry night ahead, I take a last look around. In the rearview mirror, a lime-green alien waves goodbye—or is it hello?—from in front of the Arby’s.